Few Cyberpunk settings force the involuntary spinal shiver of cold recognition. Most reach too far future for echoes of today to be heard. 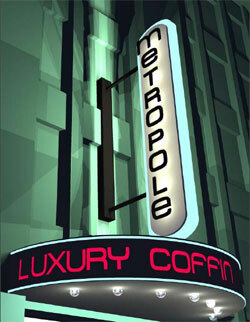 Metropole Luxury Coffin is your home for now, the last stop before forced labour camps run by the bankrupcy police. But why did a setting that is based in a single hotel win the 1KM1KT Cyberpunk Revival Project? The capsule hotel Metropole Luxury Coffin is an oasis of last-chance affordability in a dystopian near future where bankruptcy squads will hunt you down if you fail to pay for walking on the sidewalk. The hotel is where you eat, sleep and scrape out a living, with the lofty aim of having a high enough credit rating to leave. Credit is king and there is so very little of it. The telephone companies bought the banks and from that simple premise, the twisted world gestates. Your credit rating is called your Face and measured in minutes. Spend all your Minutes on doing things (opening doors, ordering food, etc) and your Face will drop. If your face hits zero, not even the art deco glass door of Metropole Luxury Coffin will open to you. The whole game is set within the confines of the Metropole, whose three hundred inhabitants are all trying to leave. Vending machines sell you the basics needed for life: food, fashion items and pointless rubbish. Technology hinges around the most important device in the game - your phone and modifying that is as important as improving your character. You don't buy mods from corporations (you can't afford it), you fashion them from the bi-product junk of a consumerist society. Characters have few stats - one for face and one for minutes, beyound that a character is defined by style. Style is everything. Having style means that everyone will know who you are. That you're a somebody. Every character has four physical places they can apply style (Head, body, feet and accessory) and you wear things to represent a brand. A brand is a theme to your character and can be any representation of a modern brand such as cowboy, hip hop, Coca Cola or noir. There is a meaty idea-spawning list to help you choose. You give your brand a name, a description, an attitude (a belief system of sorts), a taboo (what the brand is against) and slang for that brand. Lots of people supporting the same brand is known as a tribe. Face paint and cannibalism is optional. Imagination of the players is key here, the more tightly defined the brand, the easier the character will be to play and to interact with. In principle, I like systems where the imagination of the player is key. The only problems occur when you're creating characters after an intelligence-sapping day plugged into the work singular collective or when your players think its funny to use brands associated with genocide, extremist politics and My Little Pony. After brand, you randomly get a coffin number. As you advance through the game, you can change tribe, get groupies and improve the technology in your phone. The mechanics are driven by decks of playing cards - the sort you use to leech money off family at Christmas time with poker (or snap). There are two mechanics, beat (opposed actions) and match (problem solving). In beat, players describe what they want to do and bid using face down cards. If a player doesn't like what another player is doing they can bid against it or support another player (a caveat that would fall on deaf ears in my group of misanthropes). Bid winners tend to get more control than the losers. Character health is reflected in the size of your hand, the more healthy you are, the more cards you have; and bidding you can do. A match mechanism is used for doing tricky tasks and involves the player matching card numbers against the GM. In all cases, players can help or oppose each other. Which I rather like. Jokers are used by the GM to create glitches - malfunctions with modern technology that can get the characters deeper into trouble. Metropole Luxury Coffin wisely follows my Guide to Organising an RPG but I would like to see more flesh on the introduction, explained in simple terms. Jargon is good and appropriate in Cyberpunk but I need to be eased in. I am not sure that an thin introduction to RPGs is any other than filler. One should always write for the audience and I imagine that the audience for a free RPG - especially an off-the-wall one - is going to be seasoned players. I am not convinced that a deck of cards feels right for this sort of Cyberpunk. System and setting should blend as one but near-future dystopia doesn't scream 'deck of cards to me'. How often do you read a roleplaying game and think "This is different"? Metropole Luxury Coffin presents a novel world that frightens with familiarity and entertains with arid humour. 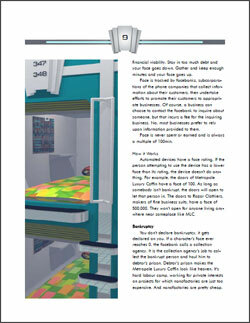 The graphics are evocative and layout appealing. Tight focus allows it to be a very different sort of Cyberpunk or an excellent insert into any existing campaign. Read it for the humour, love it for its setting, use it for its novelty. 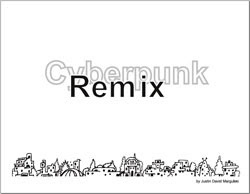 The Cyberpunk Revival Project is complete and we have a winner. A big well done and thank you to all those that took part on the 1KM1KT Forum and to the mastermind of it all, Gordon McKerrel. I think you'll agree that the outpouring of imaginative re-imagining of Cyberpunk hails the competition as a great success. The 1KM1KT judges of Gordon, Jason, Elliot and I fought for our favourites and Metropole Luxury Coffin stood head and shoulders above the others. For the other authors needing feedback, I'll be reviewing a few of the entries and will pass on my notes to the others. I urge you to peruse the entries below and please do download the wonderful Metropole Luxury Coffin. Set in a capsule hotel, Metropole Luxury Coffin is the home for the dregs of society. As players, you plan to escape the cramp boarding house. A focused game that is beautifully presented. I'll say no more because I will be reviewing it soon! 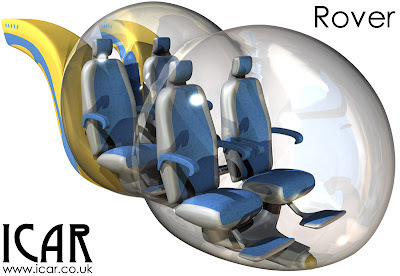 A near future game where all the technology we were promised in the 1950s comes true. The majority of the population are boring carbon copies of each other whereas player characters are important and different. Superb writing and ideas forthing with ideas such as "where mutant rats build temples to Mickey Mouse in the sewers". 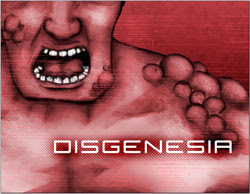 Set in an enormous utopian Mega-complex, Disgensia substitutes mutations for Cyber. Imperfections and malformed humans are hated by normal society and the corporations. As characters you either fight against or for corporations. There's a slick system picked out with superb graphics created by the author. Doubly impressive as English is not Aldo's first language. 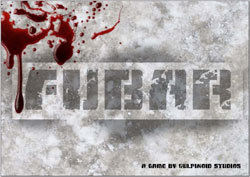 Although not laced with Cyberpunkitude, FUBAR is a focussed game of betrayal and revenge. The art layout is bold and atmospheric, it has grit and is very well written. You could take the principles of FUBAR and apply it to any genre. 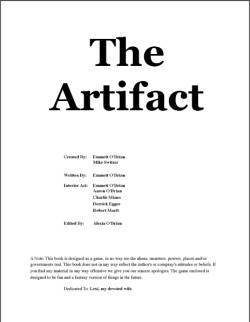 The ideas are big and broad, the final PDF beautiful. 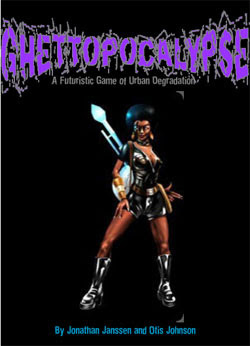 Akira as an 1970s exploitation film, Ghettopocolypse is delightful roleplaying filth set in a gritty underworld. A pulp, tongue in cheek setting a few notches more gritty than Neuromancer. The writing is immersive, graphics evocative and although somewhat familiar, it offers a new take. 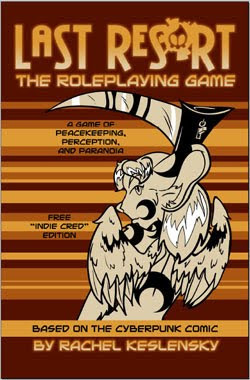 Based on the Last Res0rt web comic, this lite roleplaying game encapsulates the Last Res0rt in a charming package. Interesting races and wonderful graphics feel more Sci Fi than Cyberpunk but as a game wrapper for the comic, it does a great job. Sinister corporations have stepped in after an economic and ecological global collapse. Their solution was technological: infusing every human with nanobots that keep us healthy. 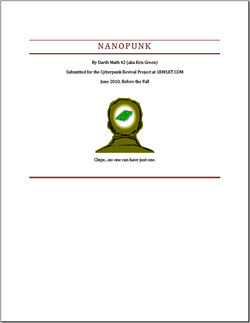 Your characters play a few generations on where nanobots are part of humanity. You operate in or against the all powerful corporations. Great descriptions of nanotech and its feels a lot like the film Equilbrium. The world is dominated by the Islamic faith, having branched from our history two thousand years ago. Although not complete, there is enough setting to play. A thoughtful take on Islam creates a believable and fascinating projection. I can only hope Andrew finished it. 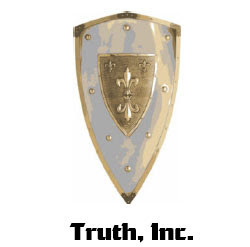 A blend of near-future technologies wraps the single powerful corporation of Truth Inc. The aim of is for the characters to uncover one of the evil plots Truth Inc. is up to. Lively and humorous writing gives the game a fresh and welcome attitude. Where have you been hiding, Lang? Hospital to have my gallbladder out (never very serious but just protracted) and then I moved house! Everything is settling down so I can start creating again. Good to be back? You betcha! Don’t bother reading my drivel, go and download Michael ‘Stargazer’ Wolf’s splendid Warrior, Rogue and Mage. If you can still remember this blog exists after, come back. Back? Good. 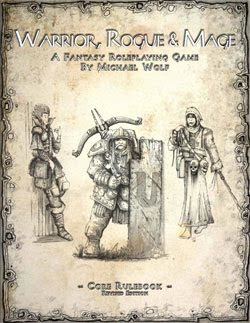 Warrior, Rogue and Mage (WR&M) is a complete, light fantasy RPG. It has everything you need to play in a beautifully produced bundle. Now and again, I get to review something by people I respect and admire. I try not to get too gushy and propose marriage. I wrote a foreword for WR&M and I would not have done that if I thought it was toilet. Secondly, it’s worth noting this this review was written over the course of two weeks and I am completing it after a tiring weekend and a glass of white wine. Are you Warrior, Rogue or Mage? Yes. A character is congealed around three core attributes: Warrior, Rogue and Mage. You assign 10 points between them, none starting higher than six. Each attribute represents skill groups and by assigning points you define your own personal class. Want to be a ostentatious warrior trimmed in silk that can wave a wand? No problem, Warrior of 6, Mage of 4, nothing in Rogue. How about a sneaky kleptomaniac wizard who enjoys pilfering people’s internal organs while they are still in use? Go for it, Mage of 5, Rogue of 4 and 1 in Warrior. Three skills are splattered on next and are learnt abilities - such as Swords, Thaumaturgy and Basket Weaving (alright, not Basket Weaving). Talents add a special ability, for example Dual Wielding, Blood Mage or Weave Iron Baskets (or maybe not). Hit points tell you how many swords can be sticking into you before your head pops off; Mana records how much ethereal power you can lob and Fate allows you to grab hold of the narrative at a crucial moment to save your character from a horde of irate middle-aged craft fair ladies. 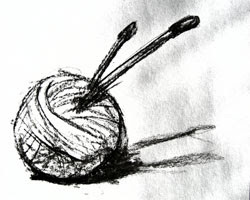 There are lists of example skills and talents, and the offer goes out to create your own (such as Basket Weaving). Everything is beautifully explained and should be a cinch to rock up a few characters in 15 minutes or so. Or, if you are one of the Buffy-esque villains that crouch slavering around my game table then its two hours to each craft identical rule-brutalising and setting-slaying characters. To do anything, you roll a D6, add relevant Attribute and Skill and compare with a target number (between 5 and 13). If you can think of something that might help, you can add two. If you roll a 6, the die explodes. Not literally, you get to roll again, adding the score. And again. And again. And again. If you’re going up against someone then the higher score wins. It’s a no frills, no shocks, no tree-deforestation game system. You can burn your Fate points to change minor details in the game world, ignore an attack or re-roll a die, or add 2 to the score. All handy things. You get Fate back for being a hero. Legolas would have Fate pouring from his effeminate pointy ears. Combat starts with initiative to ascertain order, and then an opposed action roll to hit - but using a weapon skill. If you are wading into a gaggle of goblins wielding a charming wicker chair then you’ll need Warrior + Basket Weaving. Damage is done by weapon type (wicker chair is 3 points). Spells are retained in a personal book, each spell burns a certain amount and Mana and the more Mana it needs, the more difficult it is to cast. Spell are handily grouped by difficulty into four Circles, fourth Circle being the most potent. I rather like that the effect of the spell can be improved if the player wishes - as long as they burn more Mana and accept the higher difficulty level. The spell list has a good solid feel to it - plenty of variety without going mad. By this point, you’re less than halfway through the book. Most light fantasy games are curling up their tootsies and slipping off their mortal coil to join the choir invisible. This was written by Michael Wolf and that is not his style. 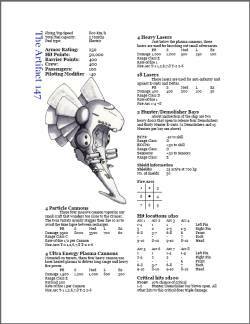 There is an equipment list (with weapon and armour details), a GM section and a setting. As settings go, it’s light but there is enough there to get the juices going. 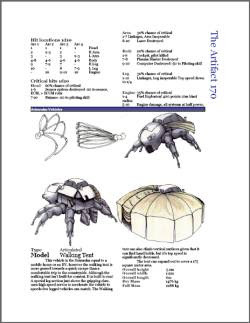 The appendix has lists of things for quick acess, there’s contents page, optional rules (included rules for Races), a bestiary, a quick character creation summary and character sheet. There’s even a back page. When reading WR&M, a nagging realisation is bound to coalesce. Using classes to represent attributes is a stroke of genius and applicable to any genre. Michael alludes to this with an optional variant Warrior, Rogue and Scholar (for settings bereft of Magic) but I think the system could be made generic. I’m not suggesting it would be better to have WR&M generic (goodness, no!) but if you were looking for a core system for your Post Apocalyptic / Cyberpunk / Sci Fi / Modern game then change the name to Something, Another Thing and Something Else, replace the collateral (skills, talents and so on) and you have a solid system. Michael has cleverly managed to sidestep my usual complaints about not following my Guide to Organising an RPG by following it. The scoundrel! I will need to dig deeper this time. If Michael were ever to update WR&M, there are a few things he might want to expand. 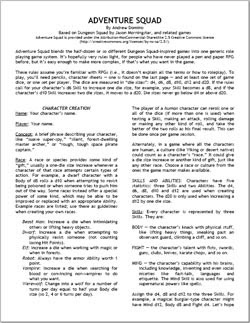 Firstly, I would give a couple of examples of character generation - one of a stereotype to help those steeped in more classic fantasy RPGs and one that would not be possible in D&D. I would include more skills that were less combat oriented and not list them on the character sheet as there is little room for GMs wishing to provide an expanded list themselves. Although there is a section for optional rules (I approve!) there are still optional rules scattered amongst the rules - I would certainly move the Warrior, Rogue and Scholar rules there. Exploding die should be optional, it isn’t really core to what WR&M is about and every 1 in 6 dice roles may explode. Finally, I would like to see more in the GM section about the pitfalls of running the system, how to set appropriate difficulty levels and so on. That sort of information is normally readily available after you have played it awhile. WR&M is the holy grail of light fantasy systems: it provides novel principles that are combined to produce a variety of outcomes. Michael wisely packed the game by licensing beautiful artwork from The Forge Studios and he clearly has a talent for layout. The prose is crisp, devoid of extraneous material and excellently laid out. Michael has set the standard that the rest of us now have to meet. Wait there a minute, friend! Jeff has updated Five by Five so I re-reviewed it. "Hold it right there, limey ginger guy! You don't like generic systems very much. You say there is nothing between them and need a setting to make them novel." - Anonny Mouse. You would be right, dear reader. Truly generic systems missing example settings leave me sighing forlornly. I wouldn't recommend anyone writes another one. I've always proclaimed it and I've always been wrong. Your character is made up from three Traits, hit points and the neccessary adornments to make them appear real, such as a name or number of buttocks. Each Trait describes something special that a character can do relevant to the setting, such as 'Circus Performing' or 'TV Chef'. Each Trait is assigned an adjective and an associated value that represents how good you are at that Trait. Your eyes have narrowed, you're frowning. You've seen this before. You're thinking there is little of novelty here. You're right. Stick with it. The onus is placed firmly on the shoulders of the player to think up these Traits. A fulsome list of Trait examples are provided at the back of the book but I envisage any campaign is likely to need its own set, putting the work back on the GM or player. There are also Intensity Traits, which boost the power of another Trait. This is handy when you are trying to make a Trait powerful at the cost of taking up one of your preciously few Trait slots. *Character advancement is dealt with by players and GM keeping track of when they roll doubles (2 of the same dice). These doubles are then saved and spent to increase your traits between sessions. The intention here is for your character to be born from the fires of conversation. Performing tuning algorithms on character builds is your aim but to create something that you can play. 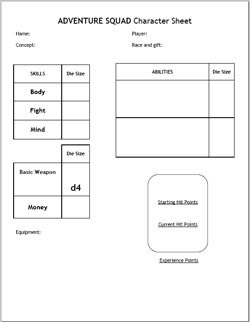 A helpful example character build is included. Generic systems rely heavily on their mechanics to for their novelty and Five by Five is no different. Five by Five uses a 'D5'. Before you reach for your clutch of dice and a an angle grinder, know that a D5 is a D6 where the 6 counts as zero. To perform an action, roll two D5 and multiply them together. If the product is below or equal to the the trait's value, you pass. I like this system because 30% of the time, the outcome is 0, which means that even for actions for which you do not have a Trait, there is still a reasonable chance you might pass. Modifiers are applied by the GM bumping the Rank up or down. Combat begins with siezing the initiative - if you succeed then you act before the NPCs. If you do not, then you act after the NPCs. Between the players, it does not matter who goes first. Damage, healing, movement, dodging, running away and healing is all dealt with neatly and with no nasty "adding more mechanics in the back door" surprises. 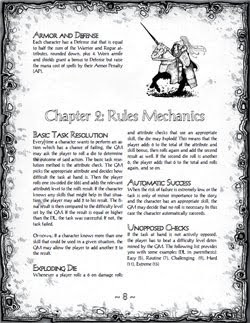 The mechanics also include rules for using miniatures if you are of that bent. My players are not, having luncheoned expensively upon several Warhammer 40K armies. Five by Five proudly sports a very good GM section. Generic systems typically stumble when it comes to examples of rule use and character creation because they are so tied to the act of being generic. Jeff neatly circumvents this problem by offering general advice on creating your Traits and also advice on what to create for a setting. By raising sign posts to setting creation, you get a feel for how the game plays. The layout of the book is excellent, clear text and wonderful artwork provided by Skorched 'Urf Studios Modern Figures Sketchbook Series. The license is CC-BY. Jeff is a friend of mine. One of those internet friends I cherish and if we were ever to meet in a bar there would be a race to buy the other man a drink. Jeff is a free RPG powerhouse and the fact I've not reviewed one of his RPGs before is so statistically inprobable that a mathematician somewhere will be writing a journal paper on it by now. Jeff has been making use of my Guide to Organising a Free RPG to build this game, which is exceptionally flattering. If that wasn't enough, Jeff has done so publically on his blog. Having followed the designer's development diary has been fascinating for me, so reading the finished product was the icing on the cake. Given that, I'm going to have a bit of a moan. 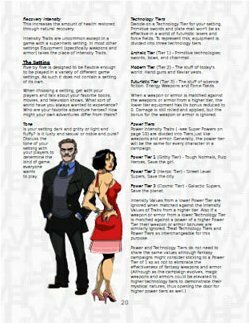 One of the facets of all generic lite systems is that they throw a lot of the effort of game design onto the player and GM. Five by Five is another example of this - although Jeff does his best to mitigate the extra work with examples. As a GM, it is not just a case of creating a setting background and a series of adventures for your campaign (a GM would normally do), you also have to craft example Traits, equipment, spells and all the other trappings your players will expect. There are many non-generic rulesets fitting your desired genre that provide that for you, leaving you the task of world building. As a player, not only do you have to get to grips with the new system but you have to create Traits for it too. If the setting is wild, hairy and new then that task is made all the more difficult. Chances are the setting would be wild and hairy else you would probably be using another ruleset. The unfortunate paradox facing all lite generic systems is that where you save time by having a small system and few pages to leaf through, you have to put more effort in because less has been done for you. If you or your player group do not mind this additional effort then ignore my blathering. I usually recommend Fate, Sketch or Risus as good free, generic systems. They satisfy me in wholly different ways and in my mind stand above the masses that jostle for attention. I would not have advised Jeff to write Five By Five but he didn't ask me and I'm glad he didn't. It is an excellent, novel system that deserves a place in my usual recommendations for GMs seeking a system for that campaign idea they have been gestating. If you don't write it, it won't get finished. Just write. It's the best bit of advice I can give. 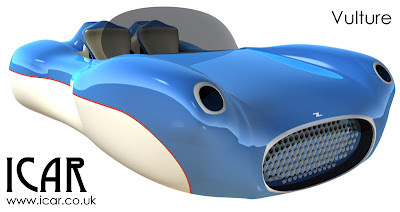 I've been thrashing out Icar version 4 and my goodness, it's a huge job. As means of recompense and demonstrating that I putting my money where my mouth is and taking a dollop of my own bitter medicine, here are some screen shots of Icar in its current state. I have uploaded a cringe worthy Alpha that is the very epitome of shoddy. Download and read at your peril. This first one depicts an example of space combat. Space combat in Version 4 is very wordy and scribbles-on-paper. 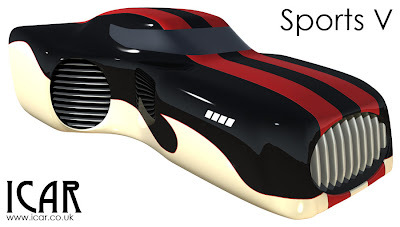 I looked at a complex three dimensional system but I decided that those systems are fine for board gaming but that is not why people want to play Icar. This second grab shows the start of the skill section and demonstrates my obsession with stuffing images in amongst the text. I can't stop doing it. I'm seeking group therapy. I do have a number of reviews in the works, have written a foreword for a delightful game by Michael "Stargazer" Wolf and and judging the frankly excellent entries for the Cyberpunk Revival Contest on 1KM1KT. Not only that but I am still penning my Guide to Writing a Free RPG from scratch. In the similar vein to my last guides but in a multi-part series. Thank you for being patient. You can always get your dose of free over at 1000 Monkeys, 1000 Typewriters, the best free online community on the net. Ever. 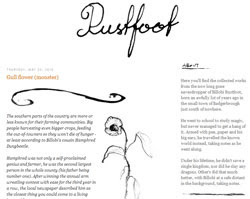 Rustfoot by Jens Thuresson is a delightful blog filled with novel components that you can air drop into any fantasy campaign. Written from the point of view of a wizard who travelled your world documenting places, deities, magical items and so on into a single book. Beautifully written with a humorous (often dark) lilt, the posts will entrall and entertain you. It has become my default bed-time reading, relegating the tower of books to a passable alternative. Take a real world item. Put 'magical' in front of it. Describe it using a few words. Magical Sword, +2 damage, forged in the flames of mount Sliceanddice. All the majesty and cool is bled away in the heat of the moment when you just have to consider the scale of damage you are inflicting on the Ork, Globin or hapless bystander. Further restrictions or rules do help the magical item to retain some of its intrigue but that is often sadly lost. It is, after all, just another +Something Magical Doohicky. Although most obvious in magic items, I think this problem exists throughout the fantasy genre. A village on a stream becomes just another village. A fireball spell just another lobbed ball of burning death. Jens has a talent for writing, crafting fresh never-seen-before ideas as well as turning existing tropes on their heads. 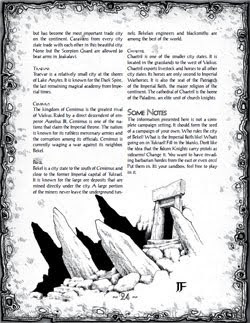 Even the hardened roleplayer who has games printed on papyrus and who has been roleplaying since before Gygax's place of birth had geologically disconnected from mainland Europe, would be hard pushed to say they've seen this all before. The presentation of each item is not a cold stat-block but a delicious description through the eyes of Rustfoot. You can't help but be drawn in. 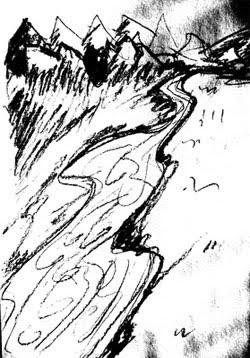 The sketches included are reminiscent of the naturalists who explored the expanse of the Pacific - they do not need to be beautifully rendered by a professional, it wouldn't look like Rustfoot had created them. Update: has added a contents page now. Superb! Thanks, Jens.. Being a blog, there isn't an index so it is difficult to browse the content. I've defended the same constructive criticism levelled at me, which is why I created the RPG Directory. Rather than labour the point, I've made a quick one below of the items Rustfoot has scribed so far. Unique, novel and bound in charm with every post. I wanted to outline a favourite but I really couldn't. The magic items and spells are the most delightful and perhaps most useful to the fantasy GM. They say familiarity breeds contempt. Wrong-foot your complacent players by breathing some of Rustfoots splendid discoveries into your game. Jens, thank you for sharing and let me be the first to demand a PDF book if it! We're all excellent consumers. I tip words into my eyes from blogs, I drip lovely audio spoo into my ears by a plethora of podcasts and scrape delicious tweets off the web. Chances are, your habits aren't too different to mine. We (do excuse my assumption that you, dear reader, are actually part of my consciousness and we are all essentially part of the Unclebear Borg Collective) read a fair number of roleplaying games. All this consumption is very well and good and might just make you a better roleplayer/gamesmaster/creator but nothing, and I mean nothing, can replace the actual act of creation. Go away and make something. Create, upload, share and improve through feedback. Stop reading this and make something, when you've made something come back and tell us all what it is. While patting out my Guide to Writing a Free RPG (which is turning into a monolithic series coming soon), I have also been working on my other monolith: Icar - doing my best to deal with all of its misgivings. As such, it's approaching a very raw alpha, which I will tentatively proffer to those poor sods who were infected by the filth that is the current version. I have a smorgasbord of blog posts about to arrive but the best advice I've only recently realised is go and make something, there is no substitute. I took an unscheduled pause, which is now clicked off and my advice to you is Go and create! Spring is sprung, the dafodils are sprouting and the collective juices of inspiration appear to be flowing. The flow is no greater than in the world of Free RPG stuff. 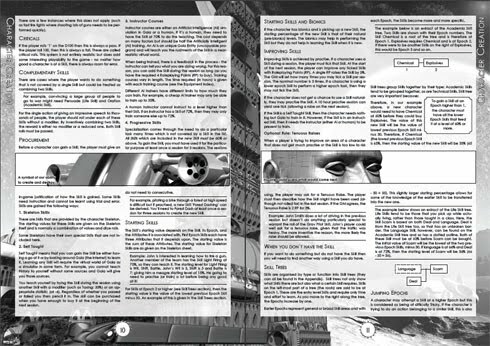 In this news update, we discover that modern Cyberpunk can be fascinating and novel, that podcasters will play any old stuff you send them, bloggers can write RPGs too, super Supers, random geomorph maps and The Free RPG Blog is going into print. 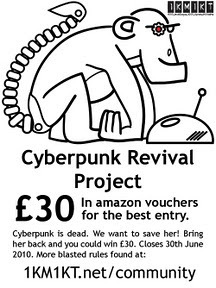 Good friend and blogger Gordon McKerrel (Twitter: new2rpg) has been running the 1KM1KT Cyberpunk Revial Competition for just over 2 months now and the creators have noses pressed up against the grindstone. The aim is to revive Cyberpunk by crafting a modern setting that feels like Cyberpunk but is an extrapolation of this millenium rather than the last. A difficult task indeed. Code named Neon by Peril Planet (Nathan Russell of the Here Be Gamers Podcast no less! 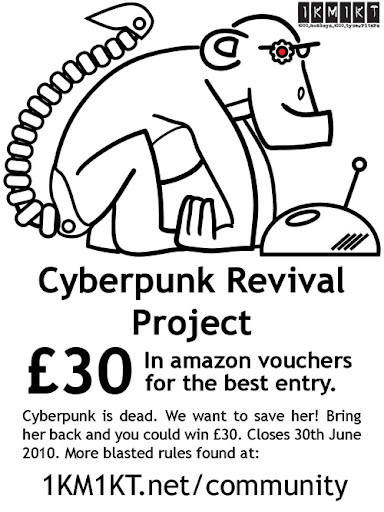 If you like Cyberpunk and think you can modernise it, then there is plenty of time to enter. You have until the end of June and only have to submit 30 pages. You can use someone else's game system as it's only really the setting we're after. It's free to enter, so you really have nothing to loose! I've been receiving some superb feedback from podcast listeners about the 60 second Guerilla Podcast. There are now 4 in the wild, have you heard one? Do you know where all four are? 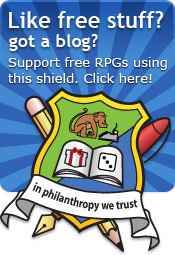 If you are a podcaster and you would like to support the Free RPG community, the please do send me an email. 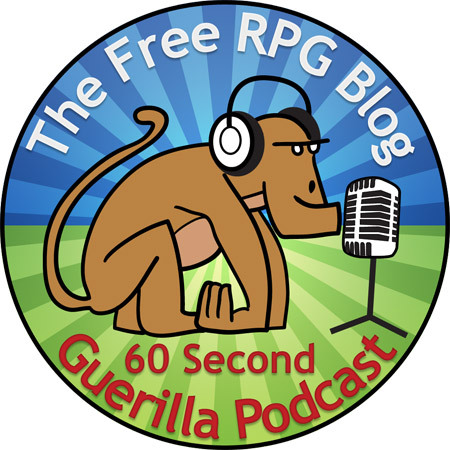 Each 60 second podcast is unique and reviews a free RPG game or resource. 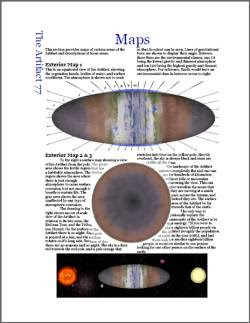 Michael Wolf, blogger extraordinaire (Twitter: StargazersWorld) is having a creative gush at the moment. 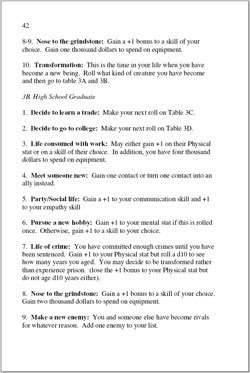 His lite system Gears, is a well rounded generic roleplaying game system that is neat and lite. Michael will probably not thank me for posting this news item because Gears isn't finished. You might have clicked the link and then come back, enraged that I've wasted your time. Stay with me for a moment. What makes Gears a delight is the fact that Michael has been blogging the process - the ups and downs, decisions and thoughts. It's a fascinating read, written at the same standard as his regular posts. Here's a summary. Gears: Ch-Ch-Ch-Ch-Changes - Michael has a crisis of confidence - I've been there! I do hope Michael completes Gears, you can keep up to date with Gears here. Michael has actually completed another project since, but I'll leave that up to Michael. 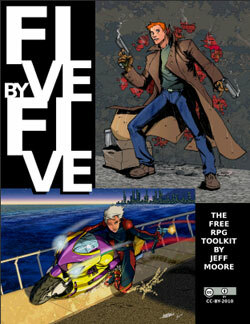 Jeff Moore is a free roleplaying game powerhouse. Imagine if you actually created every RPG project you thought of. That's the only explanation I have for Jeff, he's prolific. The fact I've not managed to review one of his games is statistically unlikely and an error I'll be fixing soon. Jeff has been developing his super supers game Xceptionalon his blog. It's fascinating to see that he applied my guide to organsing a free rpg as a brutal editor. I won't witter on any futher as I'll be reviewing Xceptional in due course. I love Dungeonslayers. Its mix of simplicity, efficiency and knowing what its trying to achieve has made me come back again and again. Christian Kennig has been spewing splendid content since my review. There are now 5 one-page Dungeons-2-Go which are all immediately playable. As if that wasn't enough there is also Forgeworks, a 4 page addon with weapons and armour. 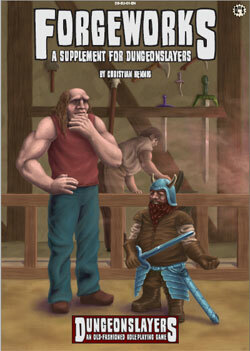 The supplements for Dungeonslayers are superb as they all stay on message: lite, efficient and effective. Geomorphs are map sections that can be printed and slotted together to make big maps. You might remember that Dyson Logos has embarked on a challenge to create a whole bunch of them. You might also recall I became nerd-aroused and used them to create a random map maker. It got StumbledUpon in a big way, so I asked OUR GLORIOUS BENEFACTOR on 1KM1KT. Dyson took a pause (more of deep breath) and is now ploughing on with more. 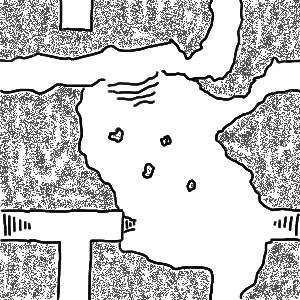 More Geomorph joy is provided by, Tim 'Risus Monkey' Ballew, who has made great use of my random map maker (with permission, natch) with his own Risus Monkey Random Map. It's effort such as this that makes me proud of being part of the Free RPG Community. I'm proud to announce that The Free RPG Blog is going to be included in Volume 2 of the Open Game Table, due for release this summer. To stand shoulder to shoulder with some simply stellar blogs and industry professionals makes me puff my chest out with considerable pride. Yes! I've been working on loads of things, here's a flavour. Chom Isis, my web game of scheming and deviousness is running its first proper full-length game. 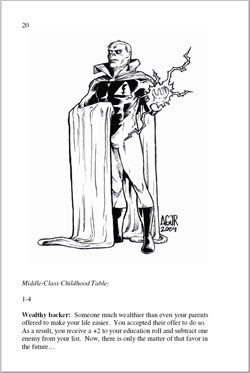 Icar Version 4 is heading on apace, I'm making great strides through the GM guide. New 1KM1KT archive. The current archive is based on Wordpress, which is ok but requires a lot of work to keep going, I'm writing a new one and progress is slow but steady. 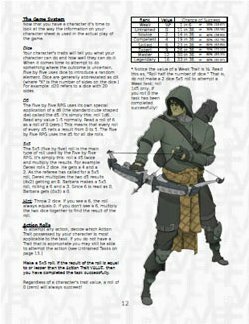 Finally, I am writing a series of posts on how to write an RPG, from the idea to the printed book. Based on the games Fallout I, II, and Tactics by Jason Mical (But written well before III came out) this is the definitive tome for role-playing in the Fallout Universe. 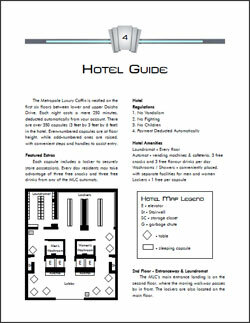 In fact, the author had permission from the creators of the video-game themselves, uses much of the material right from the sources – weapon stats, perks, images, and the SPECIAL system. For the most part, the game is quite easy to play and get into. Characters have seven attributes (Strength, Perception, Endurance, Charisma, Intelligence, Agility, Luck – hence the acronym) rated from 1-10, which in turn are used to derive a host of secondary stats like carry weight, action points, and the initial skill values. Most rolls are simply percentile based (though counter-intuitively, the maximum skill goes well above 100 to allow for large penalties) or in rare cases, a d10 compared to a character's stats. While there is a traditional XP per level system of advancement, there are no classes (Though the faster-advancing tag skills help define the character) and every few levels a Perk is gained. A great deal of effort has been put into making the game accessible to novice gamers. Examples abound, as well as a set of pre-made characters, discussion of how to write adventures, the first few acts of a sample campaign, a very through index, and a bibliography of resources used. 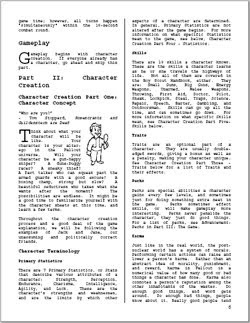 A few additional supplements available from the forum where the document is archived detailing other areas of the fallout world. The one caveat is the combat system. As with many of the other mechanics, this is take directly from the original video games, and as such was meant for the computer to resolve. Any shot you take needs to account for about five different modifiers, and damage resolution can be tricky due to the way armor works. Besides shooting, there is moving on a hex map, action points, cones of fire, crippling injuries, armor condition, and rules for fighting in vehicles. Using miniatures is all but required. While this gets easier with practice (like any seemingly difficult RPG mechanic) the Fallout world is a violent one. 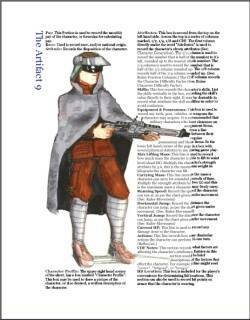 The equipment section lists 90 firearms – from a one shot zip gun to Gauss rifles – for the small guns skill alone! 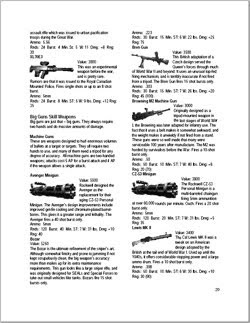 And yet it goes on with stats for big guns, energy weapons, and melee equipment – all told the armory list run from page 74 to 105!. The presentation of Fallout PnP is on par with the production values of a game from the 80's. Its mostly dense blocks of “Courier” type font, broken by the occasional Vault Boy graphic or information box. 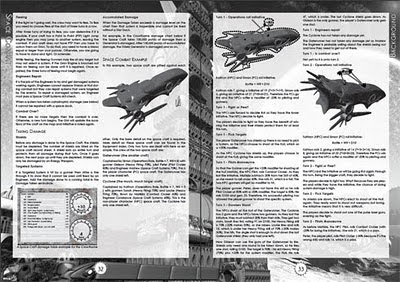 However, the weapons sections are lavishly illustrated with images right from the game (and the classic humors descriptions taken from there as well.) Perhaps not the prettiest layout, but its very functional and its easy to find what you're looking for. For those of you who are wondering, while Fallout III presents some vast changes in game-play from its predecessors – many of the weapons and adversaries are recycled. (Too many in my opinion – the plot of Fallout I&II detail why there should be no Super Mutants or Enclave troopers to inhabit DC) However, this means that you are capable a game set in the Washington ruins as well as the default western US. Someone has posted documents on No Mutants Allowed with stats for items from the Bethesda installment, but these aren't up to the standards of the initial tome. Fallout is a 1950's zeerust take on the nuclear holocaust – computers work on vacuum tubes, the remaining cars have tail fins, and radiation produces giant mutant insects. As either a reference tool for your own post apocalypse game, or a chance to take your own romp through the B-move end of the world of Fallout universe, this is a game well worth looking into. An Interview with Keeton Harrington, owner of 1KM1KT and Our Glorious Benefactor! I've reached 1000 Posts on 1000 Monkeys, 1000 Typewriters (the most active Free RPG Community) and I thought I would celebrate it with an interview with OUR GLORIOUS BENEFACTOR, the elusive owner of 1KM1KT - Keeton Harrington. For those not acquainted with the term "Our Glorious Benefactor", it stems from the fact that Keeton is rarely seen on the forums. His tireless work to keep 1KM1KT alive is behind the scenes. We would while away the long winter nights poking fun about this mysterious fellow, inventing ridiculous stories about him (like Chuck Norris). In the 2009 24 Hour Competition, we even went so far as to have people use Keeton's name as an NPC and he turned up as Arch Villains, Evil Spirits and an Incarnation of Death. Tee hee! He found out long after the entries had started rolling in. Tee hee. Keeton has grudgingly accepted the title of Our Glorious Benefactor and is a good sport with all the good natured banter. I was born in Florida, but I've lived in Texas most of my life. I currently live 20 miles outside of the Dallas/Fort Worth metroplex. 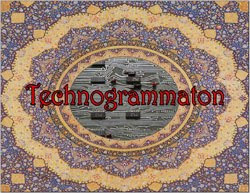 I do contract programming for corporate clients and I own and operate more than 40 web sites. I'm happy to say that I get to do 1KM1KT as part of my job. Rob Lang, my family, Bill Gates, Alton Brown, Mike Tyson, Dan Grossman in that order. If you could have a beer with anyone from history, who would be? Ernest Hemingway at one of his famous watering holes. I don't want to ask any fan-boy questions, just shoot the breeze and have a daiquiri. I never really wanted to be anything specific like a fireman, but I've always wanted to be independently wealthy. I would still like to be that. Apart from RPG Philanthropy, do you have any other geeky hobbies? I like to cook, I make my own liquor, I like programming, I used to restore classic cars, I fish, I like to kayak, I like playing Scrabble, I enjoy video games. When did you start roleplaying? In high school, around 14 or 15 years old. How did you get interested in roleplay? It was great way to hang out with my friends and spend weekends drinking soda, eating pizza and staying up too late. Do you still play in a regular game? Unfortunately, no. I wish I did, but I don't have the time to devote to it anymore. I haven't done any active roleplaying for several years now, but I do like to read the site submissions and roleplaying publications. Do you game other than RPGs? Computer/board/wargaming? I was really into Warcraft for a year with my wife. I like Axis and Allies and Risk quite a bit as well. I think I still have a few Warhammer 40k figurines from college. What game would you really love to play? I would really like to play some of the homebrew RPGs on 1KM1KT with the guys who created them. There are some really great games on there. Have you written any RPGs? No, but I've made my own settings for campaigns I GM'd. What's your favourite genre of RPG? I like fantasy, but I think I would enjoy steampunk if I were ever in a really well run campaign. Are there any other gamers in your family? My older brother was into it for a bit when I first started playing. February 16th, 2004. That's the day we registered the domain name and we started putting up content that day. Juicetyger is a screen name I picked randomly when I was in Junior High. I had just finished watching "So I Married an Axe Murderer". Why did you setup 1KM1KT? I was looking for something productive to do, I wanted to learn more about the internet, and I had friends who were enthusiastic about helping. It was one of those "why would I not do this?" kind of things. In the very beginning, what did 1KM1KT consist of? Originally, it was a review site for games and a place for articles. It was a blog before blogs were cool (or anyone knew what they were). Why did you choose the moniker 1000 Monkeys, 1000 Typewriters? My friend Chris came up with the name and we ran with it. My wife made the logo later on. Have you been paying for 1KM1KT out of your own pocket all these years? Yes, but it's not that expensive. I have the server for other projects, so the extra resources are really minimal. 1KM1KT actually turns a profit these day which is always nice. How big is 1KM1KT - in terms of games and data size on the server? File space is 426Mb, not counting the database which is probably 5-10Mb. We average right around 2000 unique visitors/day. We are sometimes graced by your Mrs on the 1KM1KT community, what does she make of all this philanthropy? She's a nerd at heart and has a huge amount of respect for 1KM1KT. She likes contributing, but she's never been a big roleplayer. Her agent is shopping her first young adult super hero novel to publishers this week, so keep your fingers crossed for that. How did the RPG Laboratory come about? I set up RPG laboratory to try and leverage the popularity from 1KM1KT into a second site. I was getting a lot of requests to host incomplete games and development ideas, so I figured a site that would give people a place specifically for that would do well. The people who contribute to that site really seem to enjoy it, but I built it on the Drupal platform and I've had a hard time modifying it. At this point, some of the users have put so much effort into the site and like it the way it is that it would take some serious motivation to make any changes. What plans do you have for 1KM1KT? I know I'm supposed to have big plans for the future, but I really like things the way they are. The caliber of the submissions is incredible and the community is really tight-knit (mostly due to the efforts of the moderators). We'll continue to expand the site as part of our normal operation, but only at the request of the people who actually use it (the recent Dyson's map maker is an excellent example). We've seen resounding success partnering with the 24 Hour RPG project (which is now officially operated by 1KM1KT) and incredible support from The Free RPG Community. I'd like to continue to foster those kind of relationships in the future. What plans do you have for the RPG Laboratory? None at the moment (see my answer above). I would be happy to release a version 2.0, but it would have to be at the request of current users. With PDF sales becoming more popular, do you see free RPGs on the decline? Quite the opposite - the commercial market for downloadable pen and paper games is pretty small, and I think free will become increasingly popular. I believe the authors on our site receive greater rewards when they publish for free rather than trying to sell their work, and there's plenty of motivation for them to keep doing so. We've had several authors leverage the popularity and free exposure on 1KM1KT into paid gigs, and we've had free contributions from professional authors as well. I have a feeling my fans are mostly just Rob... Seriously though, if you're a fan of 1KM1KT then I'm a fan of you. If it weren't for the authors, forum posters, moderators, contest runners, contributors and readers, 1KM1KT would sit quietly in a dark corner of the internet until I forgot to pay the bill. You (the fans) are the reason it's here - it's built by you and for you and wouldn't exist without you. I can't say that often enough. Are there any questions I should be asking? As Our Glorious Benefactor has seen fit to provide me with answers without asking any questions, I have taken the liberty of inventing the questions after receiving the answers. If you were to describe your life as a genre of movie, what would it be? You have managed to maintain very youthful looks, what skincare products do you use? Fruit smoothies (occasionally waffles or pancakes). Your Mrs mentioned that you have an 'Operating System Problem' and are seeking help at 'Operating System Obsessives Anonymous' group therapy (this is a long run up for a short gag, stay with me) - what OSes have been feeding your addiction? Windows Vista on the desktop, Windows 7 on the laptop, and Debian Linux for the servers. People make jokes about how Texans get a bit too friendly with animals. Have you experienced this and how did you deal with it? I had a special relationship with a dog I don't have any more named Dan. His nickname was Danifer, which I thought would be a good business name. You're a creative type of person. What is the best forgery you've ever performed? Bachelor's degree from the University of North Texas. I took a dual major for English Composition and Political Science. Telecommuting to work. I get to be with my family every day and I do things at my own pace. Subversion and the Symfony framework. Which two websites on the internet would you be mortified to find I included in the interview? You were in a North Korean prison for 10 years for a crime you didn't commit, did it affect you in any way? I'm weird about Q-tips. Ask anyone. Which technophobias do you find the most debilitating? Anything that has to do with statistics. I love charts and graphs. Thank you for agreeing to be interviewed, Keeton. You're a good sport and long live 1000 Monkeys, 1000 Typewriters. Attributes take the form of Traits (Physical, Mental and Spiritual), whose values cap their respective skills. Secondary Traits add a welcome extra crunch and measure how alien to the world the character is. Marked as optional but I'd force the gnashing, blood-shot eyed players to have them. Skills make up learnt abilities and are purchased before the life path is decided. I won't dwell on these; Sean didn't. 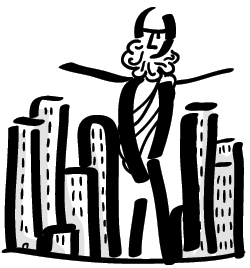 In the epic that is character generation, Traits are merely "In the beginning God created the heaven and the earth.". Your character coagulates during a trudge along a life path. The life path is a huge (yet quick) system for generating random character backgrounds and a smorgasbord of sharpened hooks for the plot hungry GM. Although the tables run into tens of pages, random rolling avoids endless pouring over the rules (which is included as an option). Lifepaths are generated by a series of random rolls. You begin by rolling for parents, then for childhood. The wealth and standing of your parents will specify which of the childhood tables you roll on. Education rolls then specify what you get to roll for on the Adult tables. You then roll for your Transformation. There is a strengths chart and a weaknesses chart and for each strength (or super power) you must roll a weakness. You can have up to four. For my players, that means they would have four. Why? Because they are just like that. Every character has a crooked, evil side (based on the deadly sins) called an Alien. This could be infection of an evil spirit or evil lurking in the recesses of your character's psyche (setting dependent). The vile urge is treated like a parasitic alien entity. As the Alien is important to the character's modus operandi, it is chosen - not randomly rolled. The descriptions cause the creative mind to froth. Enemies and friends are rolled for. The enemies table is particularly delicious - listing a superb array of reasons why you might fall out with someone. Roll d10 + skill + modifiers vs value of 9. opposed is higher roll wins. Rolls for unskilled items are d10-2. Character advancement is based on the number of sessions played. 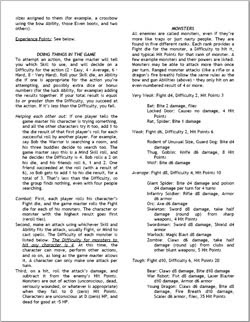 Combat is played out using opposed rolls and description with damage application requiring another roll and the use of a table. With a slick engine in general, damage feels a little like a cog with some teeth bitten off. 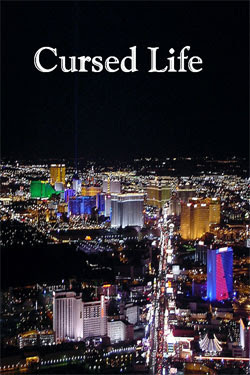 Cursed Life is set in the modern world where humans have been 'transformed', that is beings with special abilities and a dark evil too. The origin can be either from another world, a scientific explanation, spiritual warfare, planetary alignments or magic. The GM can then choose to either transform only a few of the humans or all of them. The combinations of these bring light to some fascinating settings. What if everyone on earth is from another world but people are slowly waking up to that stark realisation through a planetary alignment. As such the setting can be overlaid onto any game: fantasy, supers, modern day or cyberpunk. Quite a lot needs to be filled in by the GM but the combinatorial nature provides a broad tapestry of what Cursed Life can be. Cursed Life loves the Gamesmaster. The GM Section reads like a monologue of lust toward the GM and the tips there are mostlye solid with a few Cursed Life specific ones. The equipment section is brief and drags the RPG back into the real world. There are pre-solidified Corporations and NPCs for the GM, which indicate how the system might be played. Attractive stock Superhero art is good throughout but doesn't always convey the same description in the text. Cursed Life needs a thorough application of my Guide to Organising an RPG. In particular, I would have liked a brief introduction at the start of the game that details what the characters actually do and why the game is worth playing at all. It's important and should be at the front, bold as brass! Some explanations are marred by lots of "GM can do modify this" caveats. Noting that the GM is free to change and modify to suit is important but need only be included once. I also think the Lifepath section should be performed first so that Traits can be set to match the character's upbringing. Cursed Life is a toolbox of ideas that can be combined and combed into a unique quiff. To some, a boon. To others (the time strapped GM), a pointless extravagance. Cursed Life does need effort from the Gamesmaster to get running but the settings you would generate can be novel enough to intrigue and familiar enough to be unsettling. Cursed Life is a glinting gem. Thank you to Sean for sharing some very large ideas. Mistercho, blogger, philanthropist and Scotsman has kindly stumped up thirty of his British pounds to sponsor a competition over on 1KM1KT. I think we should all enter. Not because you love Cyberpunk as much as I; not because the idea of modernising the typically 80s feel of Cyberpunk is a tantalising goal but because forcing Misterecho (a Scotsman) to part with thirty coins bearing Her Majesty's mug will be one of the most life changingsteps he will ever have to take. That and crossing south of Berwick Upon Tweed to buy printed matter! Quite simple really. Cyberpunk is really an 80s phenomenon and although there have been authors in naughties to paint their own particular impression of the genre, we as roleplayers have a somewhat dated bible. The competition is to forge a setting (and rule system, if you're so inclined) that has more modern concerns and does away with shocking neon 80s fashion and dated ideas about the net. Misterecho's thought processes spawned a fascinating thread on 1KM1KT, which I am glad to have participated in as well as learnt much from. Pop along there for some inspiration. I do love the original Cyberpunk, and Cybergeneration. And Corporation. And other other Cyberpunk games. I know others have done this well but we think it should be done again. For free this time! It's free to enter, so what do you have to lose? Apart from your sanity. But then, you're a roleplayer, is your sanity realy intact? It's probably worth a swing for trading the tattered remains for £30!